Johanna and Blais run their own parenting blog, Blog Nouveau Parent, where they write about the adventure of life with their three children. 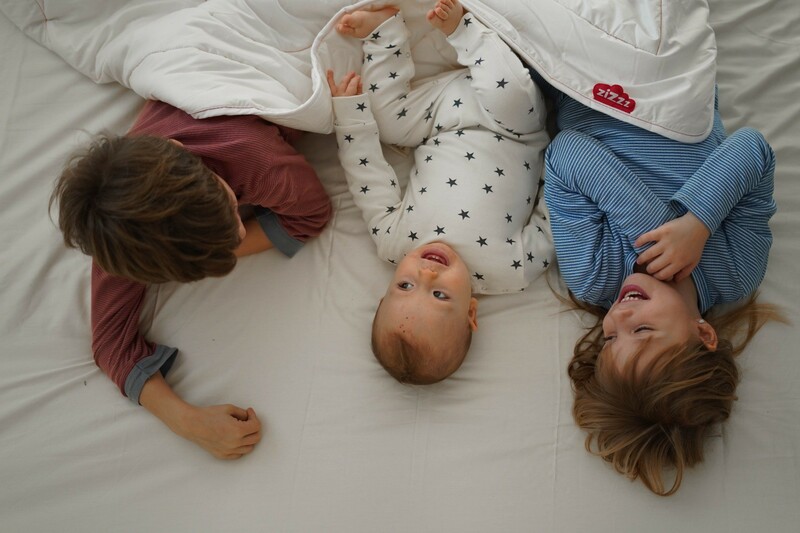 Sleep becomes a bit complicated when you have children... ;) and Johanna has shared with us some aspects about their sleeping habits and routines with their kids. My mornings generally begin at… 5 or 6 am. My alarm rings like… the caress of a baby. Really, my littlest one wakes me like this, by pulling my cheeks. My typical breakfast… I normally don’t have breakfast. I just have a coffee or an herbal tea. I’m one of those people who feels in better shape by not eating in the morning. My special breakfast… on the odd morning that I am hungry, I mix a frozen banana with a bit of rice milk, a teaspoon of almond butter and two CS of flaxseed. I pour it all into a bowl and add oatmeal, some almonds, crushed hazelnuts, gogi berries and a sliced fruit. Or a brunch with friends. My kids are generally in bed by… The two big kids are generally in bed at around 7:30 pm. They read a little before going to sleep. My youngest child goes to bed at 6:30 pm, as he gets up from his last nap at 3:00 pm. I’m in bed at… These past months, I have to admit that I’ve been going to bed early, at around 9:00 PM, as the littlest one wakes me up rather frequently. But as a general rule, I go to bed later when the children sleep well. But I try to make sure that it’s before 11:00 PM. What I generally do before turning off the lights… The last thing I do before turning off the lights is to check on each of the kids to make sure they’re ok.
What I wear to bed… A soft pair of pyjamas. What I consider important to get a good night’s sleep… Regular exercise. A well-balanced meal in the evening and I favor a calm activity before going to bed. My best advice for a good night’s sleep… Not having little blond children who wake you up (laughs). Just kidding, but other than that, I think it’s important not to go to bed too late. On my nightstand, there are… Books. My favorite sleep position… Is to test all of them throughout the night ;) but my favorite is on my side. My favorite song to listen to before bed… Just before bed, I listen to music to meditate to. What I do to fall asleep… I close my eyes! I have to say that I fall asleep very quickly… I’m often tired. Yesterday, I dreamt that I… Wow, to be honest I can’t remember what I’ve dreamt in a long time. Or only very vaguely in the morning and then it vanishes. My ideal bedroom would be… Minimalist with a large bed. We have a 200x200 cm bed. What I like the most about Zizzz Products… I like rolling around my satin bedsheets in my soft pyjamas, both of which are from Zizzz!